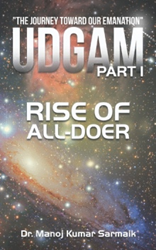 An intelligent boy is taken from his parents, but as he grows, he realizes he might be the only person who can save humanity from one who would destroy it in Dr. Manoj Kumar Sarmaik’s new adventure novel, “Udgam Part I: Rise of All-doer” (published by Balboa Press AU). Since childhood, Aarav has strange, vivid dreams that inspire him to understand his existence and humanity’s origin. According to the All-doer’s laws, highly intelligent children like Aarav can be taken from their parents at the age of five to attend the lords of society. While at school, the principal recognizes his uniqueness and gives him information from old books to help him attain the answers he seeks. Through his reading, Aarav discovers the All-doer plans to soon annihilate humanity, but someone living inside Kalemon Mountain can save the world. With a friend’s help Aarav begins his journey, but many enemies seek to stop him, which make the trek arduous for Aarav. However, he attained mind bending answer for his curiosity. This book is questioning substantiality of science. Dr. Manoj Kumar Sarmaik holds a bachelor’s degree in dental science and studied at Jawahar Navodaya Vidyalaya, JNV, in Theog, India, and Curtin University in Perth, Australia, where he developed his love for writing. He mixes science with spirituality to answers questions about mankind’s creation and why humans are here. “Udgam Part I” is Sarmaik’s first book.